I don't give up easy, I care about the tiny details, and I find joy in things that sparkle. This made me a committed and fun-loving English teacher for five years, but as my anxiety disrupted and took hold of my life, I knew something had to give. Living with anxiety is not a stressful few days, weeks, or months. It's an exhausting lifestyle, a tumultuous habit of (over)thinking, that makes even the smallest tasks seem insurmountable. When you exhaust yourself of your mental, emotional, and physical resources, you hit bottom. In starting over, where do you even begin? I like to think there's more strength in getting back up than weakness in falling down, and I learned this through my physical yoga practice. So much in life we can't control, but we can control our breath and movement. We can recover. We're going to fall in life, but we can get back up. The lessons you can learn about yourself on the mat are transferrable to your life off the mat. All people deserve to access that wisdom - the good stuff that's free and already inside you. 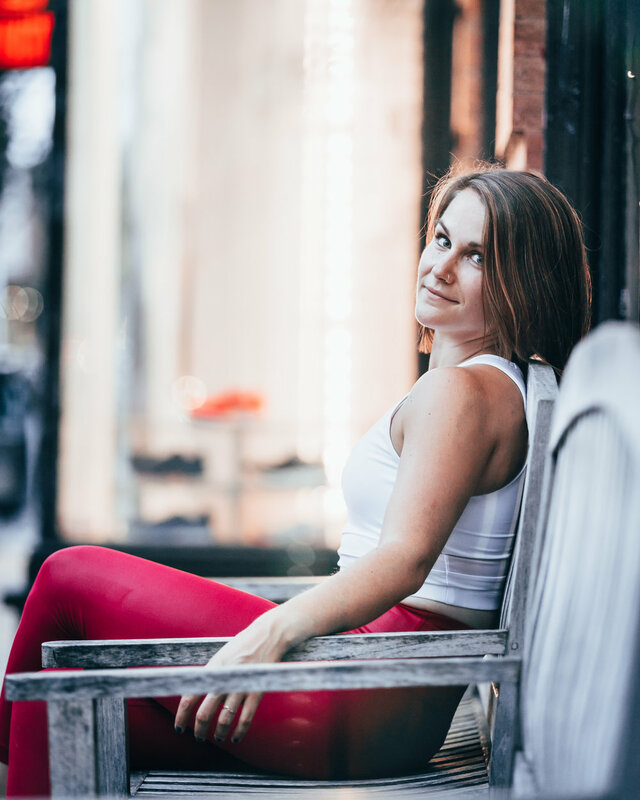 Maria Sylvester Terry, a Philadelphia native, is a registered yoga teacher and graduate student at Drexel University, where she is pursuing her degree to become a registered dietitian. Her Masters thesis research is centered on athletes’ micronutrient nutrition & athletic performance. She completed Dana Hot Yoga's 200-Hour Vinyasa Yoga Training in 2017, and YogaFit Teacher Training in 2010. Teenagers, kids, division I athletes, runners, tired teachers, studio clients, and community members - Maria has experience teaching a variety of individuals (however, her favorite student is her standard poodle, Josie). Maria resides in Center City with her husband Caleb and two fur babies.